Before I returned to Watkinsville to practice law in 1970, I made a courtesy call on several local officials: Clerk of Court Bessie O’Dillon, Probate Judge Reba Hammond, Sheriff Charles Holcomb, Commission Chairman Herman Michael, County Agent John Brannen, School Superintendent Sammy Sanders and long-time county attorney, Robert Nicholson who had his desk in the Clerk’s record rooms. James Moseby was practicing in Watkinsville on a part-time basis. I visited him also. Everyone was gracious and encouraging including Mr. Robert. After I opened my office in July 1970, my practice became very active. At times, I sensed that “Mr. Robert” saw me as the “new boy on the block”. In time, I was doing some of the things that he had done for decades. Because of his age and position, I had the utmost respect for him. We became close friends. We were in the Civitan Club together. We attended the “coffee breaks” at Jim Booth’s. He and Mrs. Jessie rode with us to some Bar and Regional Civitan functions. I had the good fortune in helping organize Robert Nicholson Day at Harris Shoals Park in April 1978. Reverend Elmer Anthony, BOC Chairman Roy Berry, Mayor Amrey Harden, Attorney Rupert Brown (the then dean of lawyers in Western Circuit and author of Brown’s Forms) and others were speakers. It was a pretty day and many folks attended. Many of his friends and relatives were there. In connection with that occasion, a picture of Mr. Nicholson was commissioned to hang in the Courthouse Hall. 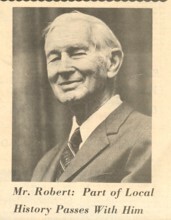 A program or fact sheet about Mr. Robert was placed (by me) in the back of the picture to preserve some historical record about this man who held several county offices as noted in Peggy Lowery’s Obituary Article in the Oconee Enterprise on February 5, 1981. Many folks called him “Mr. Robert” a term of affection and respect. At least twice a day, he would gather most of the courthouse folks to go to the corner café of Jim Booth for a coffee break. I would put a note on my entrance door: “Be Back In a Minute”. In those days, things were quieter and no one was left in most of the offices. It was a time of learning about our officials and community leaders. It was a relaxing social occasion and many of us enjoyed it over the years. In later years, Mr. Robert had an easily recognizable Green Chrysler that had accumulated many dents. Most friends and family would offer to drive to keep Mr. Robert from being the driver. He would get up early and plow and cultivate his large garden behind his house on Main Street. Mr. Robert (some said Mr. “Nick” and some said “Mr. Bob” but most locals said Mr. Robert) would bring vegetables to share with the folks at the courthouse. He loved to talk about his self-propelled garden tractor and his gardening experiences. He stayed strong and in good health until his last couple of years. (7) About the untimely death of his young son, Marion Nicholson, who died in an automobile accident as a young man. To some of us younger lawyers referred to Mr. Robert as “the official deed doer”. He had been doing deeds for Oconee County folks for generations and many locals remained faithful. Some of us younger lawyers would occasionally encounter (one of ours) a relative sitting beside Mr. Robert in the Deed Room while he was typing their deed as well as many wills. He was respected by the Judges (Barrow and Gaines in my day) and by area attorneys. He was familiar with the law of private ways and obstructions of such long-use easements. Sadly, current lawyers and judges (appellate level too) have not dealt with that kind of problem in modern society and a whole body of case law is seldom accessed these days. Oconee and Watkinsville city attorney emeritus, Robert M. Nicholson, died Monday at home after a brief illness at the age of 90. Funeral services were held yesterday (Wednesday) afternoon at the Bernstein Funeral Home in Athens with burial in the Watkinsville Cemetery. Mr. Nicholson is survived by his wife, Mrs. Jessie O. Nicholson, two daughters: Mrs. Gerald McRee and Mrs. George Cowart of Watkinsville; his son, Julian O. Nicholson, Sr. of Decatur; and three sisters, Mrs. Emma Sue Leslie, Mrs. Carr Johnson and Mrs. Walter Hamilton. The Nicholsons have six grandchildren and seven great-grandchildren. Mr. Robert, as he had come to be known around this area, was born in upper Greene County in 1890 and moved, with his family, to Bishop when he was eight years old and then to Watkinsville in 1890. Later, while attending the University of Georgia Law School, Mr. Robert was a member of the Redcoat Band as a coronet player. After receiving his law degree in 1913, Mr. Robert joined a law firm in Fort Valley and married his childhood sweetheart, Jessie Osborn, in November of that same year. He moved his family back to Watkinsville in 1918 and since his return had served in Oconee County in several capacities. After teaching for two years at Rose Hill and Ross Chapel Schools, Mr. Robert was elected in 1921 to serve as county school superintendent. He held that position for a total of 12 years, and during that time, Mr. Robert instituted the first public school transportation system in the county. In the early 1930s Mr. Robert was appointed by then-Governor Richard B. Russell to serve as judge of Oconee County Court but later requested that the position be eliminated. “I decided that the county was not getting enough value for the money that they had to pay for (court) salaries, so I drew up a bill and had the (state) legislature to abolish the county court, Mr. Robert explained in an interview several years ago. After becoming further involved in politics in the 1940s, Mr. Robert served three terms as the Oconee County representative to the state legislature. He also held the position of county attorney from 1926 until 1970. Mr. Robert was one of the original directors of the Oconee State Bank when it was founded in 1960 and continued to hold that position until his death as well as serving as a vice president and a member of the bank’s loan committee. Although he considered himself “virtually retired”, for the past ten years or so, Mr. Robert was usually seen walking his daily morning rounds around Watkinsville, checking in at the bank and sometimes stopping by his “office” tucked away in a corner of the clerk’s record room in the courthouse. As a Charter member of the Watkinsville Civitan Club, Mr. Robert took part in the group’s 50th Anniversary celebration this past December. He had been honored by his fellow Civitans back in April of 1978 when they sponsored a community Robert Nicholson Appreciation Day in honor of his 88th birthday. “We all appreciate those kinds of recognitions,” Mr. Robert said at that time. “I enjoy life, and I believe anybody who stays busy won’t get lonesome” is the philosophy he expressed then and one he held until the end of his life. Mr. Robert will be missed in Watkinsville and all around Oconee County because a part of our local history has passed away with him.